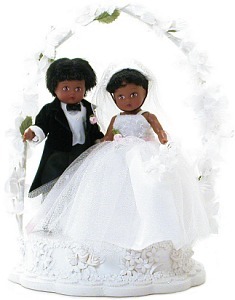 5" Mini Cake Topper African American features Wendy with her groom under an archway of pink roses. This brunette beauty is wearing a strap dress with a beaded waist and headpiece. Her skirt is spectacular layers of tulle, and her dress is accented by sweet pink roses at her waist. Her groom is wearing the classic black and white tux with a matching pink buttoner. Retired item - available for limited time.